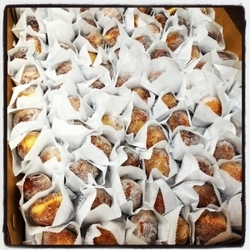 The Dolly’s doughnuts, paper-wrapped and ready. Photo courtesy Doughnut Dolly website. The bar at Longitude. Photo by Gabriel Hurley. Extremely sad news for the many regulars and lovers of the pancakes at ~BETTE’S OCEANVIEW DINER~ (and the special woman behind them): chef and co-owner Bette Kroening has tragically passed away at 71 from cancer. Be sure to read this thoughtful piece by Jonathan Kauffman about her important contribution to our local culinary scene, feeding so many of us so well while taking good care of her staff, since 1982! Condolences to her family and many friends and fans. Sorry to read ~DOUGHNUT DOLLY~ is closing her Berkeley shop after failed lease negotiations with her landlord. Fortunately you can still get your naughty cream fix at her Temescal Alley location and in The Market in the Twitter building. 1313 9th St. at Gilman, Berkeley. And, man, sorry 510 for all the bad news, but I was also so sorry to hear that Suzanne Long is closing her beautiful tiki outpost, ~LONGITUDE OAKLAND~, after three years in business. You need to come in for your last mai tai before this Sunday March 5th. 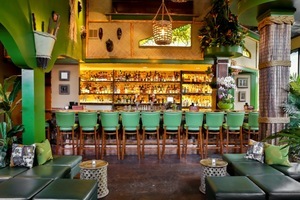 The tiki community, bar community, and many cocktail aficionados are going to miss this special bar. 347 14th St. at Webster, Oakland, 510-465-2008.